A crown covers a tooth and restores it to its normal shape and size. A crown can make your tooth stronger and improve its appearance. It can cover and support a tooth that has a large filling. It can be used to attach a bridge, prevent a weak or brittle tooth from breaking, or restore one that’s already broken. 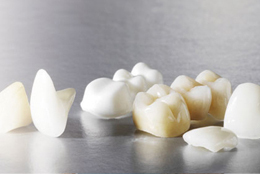 Our studies on “crown technology” help in the selection of the crown material that best suits each patient’s needs. Dr. Ediger’s experience with “crown technology” is used for developing a treatment plan composed of different properties depending upon the placement of the crown and the properties of other existing tooth structures…especially opposing teeth. Posterior teeth for example, endure extreme forces when we chew and grind our food. Anterior teeth are not used in the same fashion. Restoration products for these 2 different areas of the jaw should have different properties. Porcelain properties of crowns differ. Some crowns are bonded to nickel….others may be bonded to gold. In certain applications, the crown may be 100% porcelain. Patients in our practice are provided a choice of treatment materials that can create any degree of cosmetic or dental function desired. Depending upon the interests of the patient, products from resources include Procera, Lava, Nobel Biocare and Ivoclar/Vivadent (IPS Empress). Our technical knowledge determines which porcelain product offers the best balance in dental cosmetics and long term endurance.